AUSTIN, Texas (AP) — Game after game, Sam Ehlinger and the Texas offense keep putting together game-clinching or game-winning drives. The latest came this past weekend with Ehlinger’s touchdown pass to Lil’Jordan Humphrey with 29 seconds left to beat Texas Tech. Before that was the drive for the game-winning field goal against Oklahoma. There was a drive to run out the clock in a close win over Kansas State. And even a win over Tulsa required a fourth-quarter touchdown drive to kill a rally. Give the quarterback the chance to put a game away, chances are he’s going to do it. Even when No. 13 Texas lost to West Virginia, Ehlinger and the offense had given Texas the lead with a long touchdown pass with 2:30 left to play before the defense gave up the Mountaineers’ final touchdown and 2-point conversion with 16 seconds left. About the only time it didn’t happen was the opener at Maryland. Ehlinger’s misfired throw toward Humphrey was intercepted at the Maryland 11 with 1 minute left, and the Terrapins ran out the clock on a 34-29 win. Ehlinger hasn’t thrown an interception since then and his Big 12 record of pass attempts without a turnover has reached 280 heading into this weekend’s matchup with No. 18 Iowa State. Both teams need to win to stay in second place in the Big12. It’s not all perfect. Texas could have squelched Texas Tech’s rally in the fourth quarter but went 3-and-out to give the Red Raiders the ball to march for the tying touchdown. Herman called it the worst possession of the game. “We know how to make them interesting,” Herman said. After Texas Tech’s last touchdown, Ehlinger ran three times for 33 yards in a seven-play, 75-yard drive before finding Humphrey for his fourth touchdown pass of the night. Texas went into Lubbock on a two-game skid and blowing a big lead for a third loss might have killed the season. Against Oklahoma, the Sooners trailed by 21 before tying the game with 2:38 left. 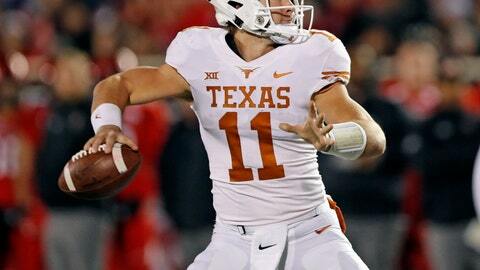 Texas then marched 52 yards in nine plays to Cameron Dicker’s winning field goal. That win still looms big because it could give Texas the tie-breaker edge over the Sooners for a spot in the Big 12 championship game. That hasn’t been the case at Texas in years. At 7-3, the Longhorns have their most regular-season wins since 2013. They are fighting for a conference championship for the first time since 2013. Ehlinger is just a sophomore and didn’t play through a lot of that losing. Herman noted Monday that a lot of his players did.